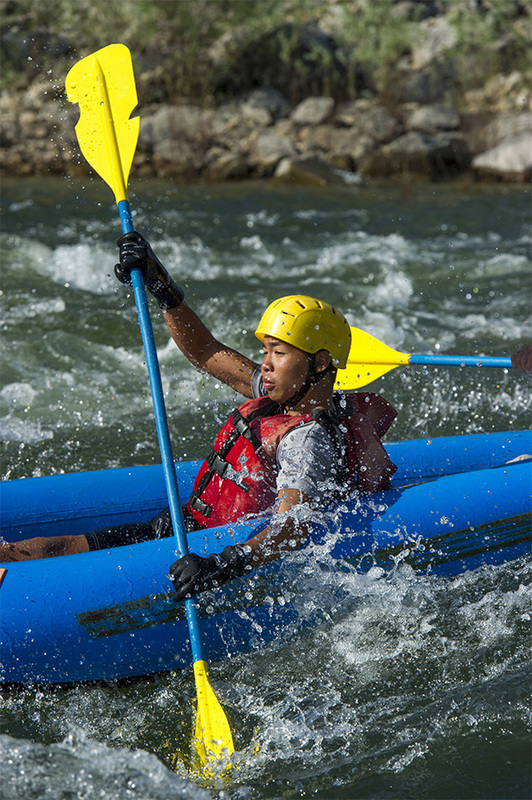 Jean Devera, my “Cover Boy” for Boy’s Life Magazine, is captured paddling through Elkhorn rapids prior to reaching camp at Deadman on Day Three of the scouts’ whitewater rafting trip down the Salmon River in northern Idaho. I often get asked, “What’s been your favorite assignment?”. Much like with a bucket list there are assignments you hope to cover in a career and then there are the ones you have encountered and register deep in the memory bank. Just about a year ago one of those occurred. I joined a group of seven senior scouts and their four adult leaders from St. Croix in the U.S. Virgin Islands on a river expedition of the Salmon River in Idaho. I was assigned by Boy’s Life to document these young men’s adventure. The story was just released about a week ago. Living in Idaho years ago I had heard many tremendous stories of the “River of No Return” but never had a chance to explore the river until last summer. 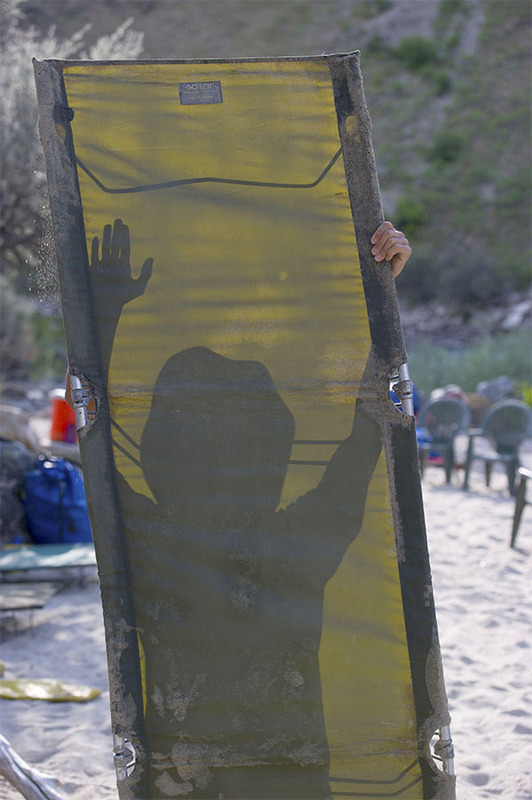 The five-day float took the expanse of 94 miles of the Main Salmon River. 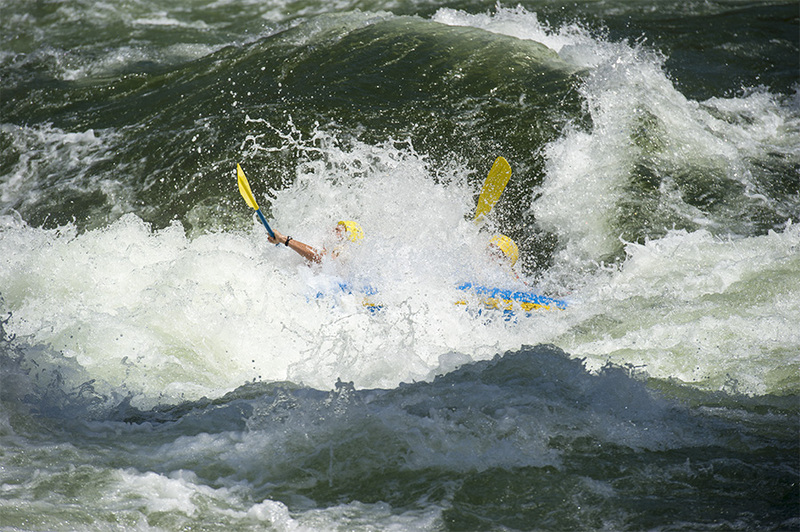 We covered nearly 80 miles of the most scenic and raft-gobbling white water this giant flow of water could offer. Verle Dureden, guide and owner of Action Whitewater Adventures, who orchestrated the trip, told me during spring runoff certain sections of the river would crest at 40 feet. And I bared witness to the scarred walls of the canyon to prove it- shivering at the thought that over 100 years ago the first explorers of this river floated it in raw-timber rafts. Each day presented incredible experiences and it definitely gave me a chance to relive my youth. It’s hard not to when you are amongst some well-mannered, experienced scouts that are total thrill seekers. Camping on pristine sandy beaches carved and manicured by the powerful river, sleeping under the stars with an occasional call of an owl and the ever-present rushing sounds of the river complimented with daily roller coaster rides of white water rapids engulfing your raft with names of the likes of Split Rock, Salmon Falls, Big Mallard and Elk Bar made for lifetime memories. When the expedition came to an end and we pulled our supplies from the rafts and deflated the crafts to be ferried back the AWA headquarters, I kept mulling in my head, “couldn’t we just go a couple more days?”. I am pretty sure the scouts felt the same way. 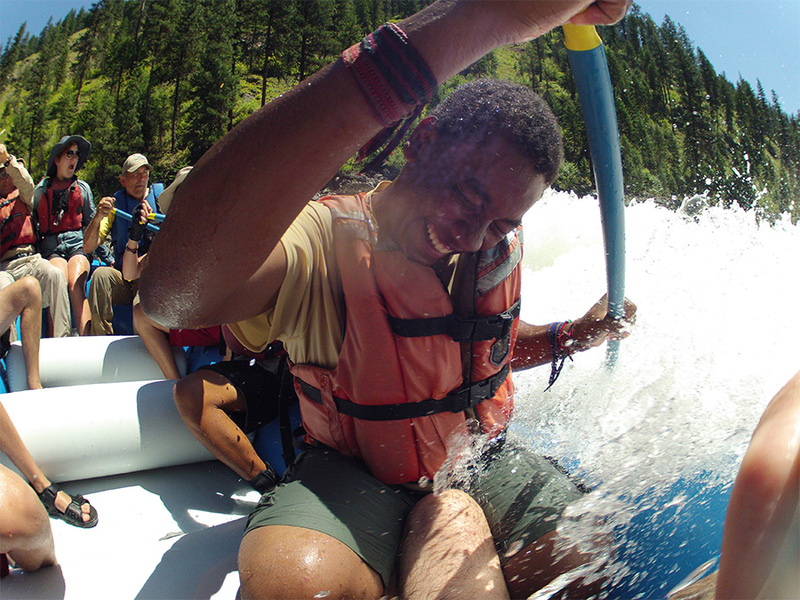 Awquen Irish from Boy Scout Troop 227, from St. Croix , U.S. Virgin Islands gets blasted from a wave on the first day of river running during the their whitewater rafting trip down the Salmon River in northern Idaho. 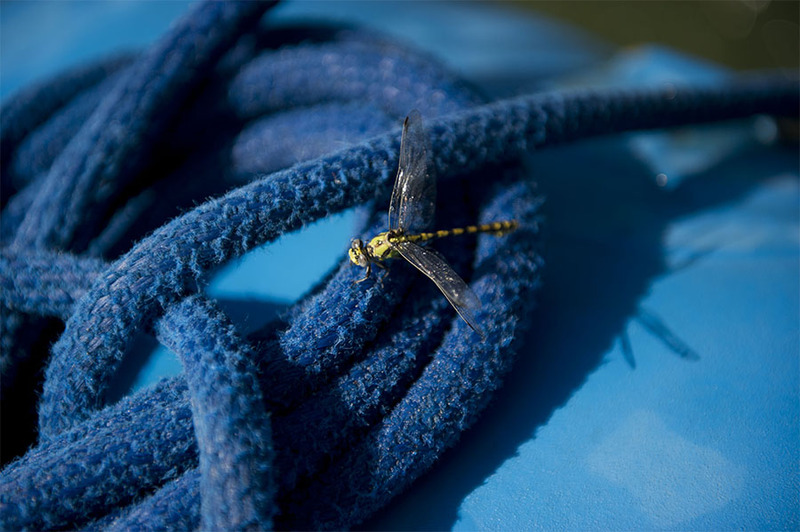 A dragonfly rests atop bow rope on a raft during the St. Croix Boy Scouts,Troop 227 whitewater rafting trip down the Salmon River in northern Idaho. 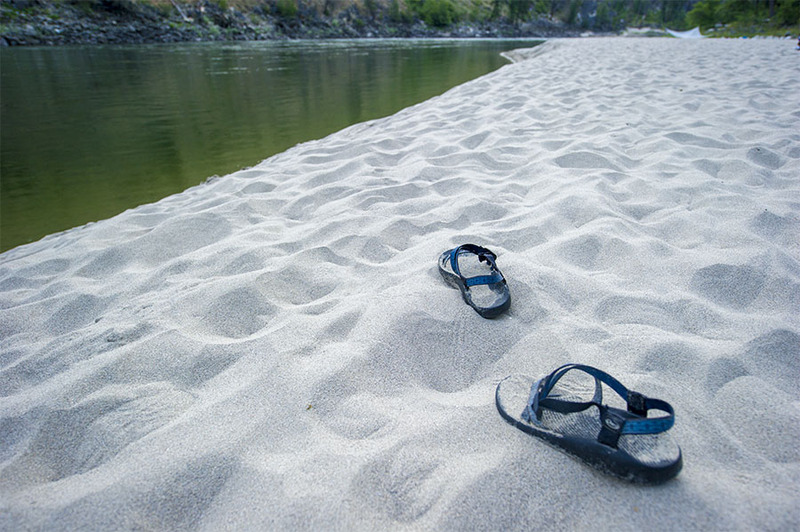 On the morning of Day Five a pair of scout’s river sandals sits idle in the sand on the Maxwell river bar on Day Five of their Salmon River whitewater rafting trip in northern Idaho.